For many people, the name "Ernst Haeckel" is most associated with slightly dodgy illustrations of vertebrate embryos that have doomed his memmory to be quote-mined by people with an agenda to push for all eternity. 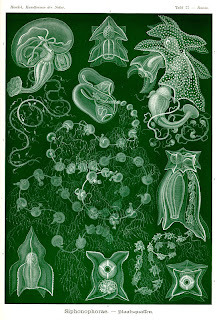 For others, though, the epitome of Haeckel's work lies in the many spectacular illustrations of invertebrates and protozoa he produced in such works as his reports on the biological material collected by the HMS Challenger expedition, and his 1899-1904 Kunstformen der Natur ("Artforms in Nature"). With their awe-inspiring detail and spectacular presentation, the plates he produced are more than just technical illustrations, they are true works of art. Perhaps among the greatest of his productions were the plates of siphonophores, an example of which is shown above. Baroque tentacled horrors, they loom out of the page threatening to engulf Dunwich. I wouldn't be able to tell you whether Lovecraft had ever seen one of Haeckel's illustrations to inspire him in his descriptions of the twisted hybrid offspring of Yog-Sothoth, but the resemblance is uncanny. 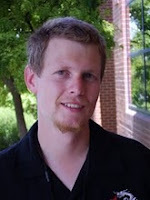 Siphonophores are planktonic cnidarians (the group that includes corals and jellyfish), distantly related to hydras (a good online reference on siphonophores has been put together by Casey Dunn). The most familiar member of the group is Physalia, the Portuguese man of war (so-called because of a supposed resemblance to that form of ship), but on the whole Physalia is not very typical of the order. All siphonophores are colonial, in their way - incomplete budding leads to the production of a colony of generally large numbers of metabolically interconnected zooids that are developmentally homologous to the more independent polyps of other cnidarians. However, the individual zooids of siphonophores are each highly specialised for separate divided functions such as feeding, reproduction or motility, meaning that siphonophore zooids are incapable of living independently of the colony. Perhaps more than any other group of organisms, the siphonophores challenge the question of what defines an individual or a colony, which has led to their description as "superorganisms". Siphonophores have been divided into three main groups, the Cystonectae, Physonectae and Calycophorae, but the phylogenetic analysis of Dunn et al. (2005) found calycophores to be nested within physonects, the two together forming a clade they named the Codonophora. Cystonects (which include Physalia) form the sister-group to the codonophores, and share a colony morphology characterised by a division between a terminal pneumatophore (float) and the siphosome, the region of the colony containing feeding and reproductive zooids coming off a central stalk (in Physalia the central stalk is relatively short, but other siphonophores will have exceedingly long colonies). In the "physonects", the pneumatophore and siphosome are separated by the nectosome, a region of generally bell-shaped zooids called nectophores specialised for motility. In the calycophores, the pneumatophore has been lost and the colony is composed of the nectosome and siphosome. The illustration at the top of the post represents the physonect Physophora hydrostatica - the pneumatophore is the bulb-shaped structure at the top, with the zooids of the nectosome between the pneumatophore and the tentacle-like structures representing the top of the siphosome. These latter structures are not actually tentacles (the tentacles are the filaments radiating from the siphosome) but palpons, zooids whose function remains unknown but has been suggested to be related to excretion or defense. Underneath the palpons are the gonophores, the reproductive zooids, with separate male and female forms (males and females may both be present in a single colony, or there may be colonies of separate sexes). The large funnels like the horn of an old gramophone are gastrozooids, the feeding individuals. The clubbed side-branches on the trailing tentacles are tentilla, and contain concentrations of nematocysts for capturing prey. Most codonophores (but not cystonects) also have shield-like gelatinous bracts protecting the siphosome. Cystonects also have structures called gonodendra, which are concentrations of gonophores, palpons and also specialised nectophores that can propel a detached gonodendron through the water. Many codonophores are bioluminescent - the bracts may contain luminescent cells, and at least one member of the genus Erenna has flashing red tentilla that probably function as lures. 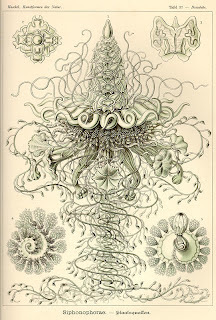 The Physonecta illustrated above has only one iteration of the siphosome, but in other forms (such as the one illustrated below in another Haeckel plate) the clusters of palpons, gastrozooids and gonophores may form iterative elements that repeat continuously down the growing stem. Despite what can only be described as their inherent coolness, siphonophores as a group are poorly known. Like other planktonic cnidarians, their gelatinous structure makes them quite frail and difficult to collect. The entire colony may be only loosely connected by the slender stem, such as in the example just above. Some siphonophores reach spectacularly large sizes - species of Apolemia may be more than 30 m in length, yet only a few centimetres in diameter. Attempts to net such specimens using conventional means would be lucky to retrieve anything more than disassociated mush. Dunn, C. W., P. R. Pugh & S. H. D. Haddock. 2005. Molecular phylogenetics of the Siphonophora (Cnidaria), with implications for the evolution of functional specialization. Systematic Biology 54: 916-935. Haeckel, E. 1899-1904. Kunstformen der Natur. Bibliographisches Institut: Leipzig & Wien. Amazing technical illustrations. Thanks for sharing. Not sure I understood much except the last sentence about retrieving mush (from the deep). However, having seen the recent efforts to dissect the Giant Squid that makes more sense to me. But the artwork is superb. One thing puzzles me -- why the "superorganism" idea. Aren't the different zooids really the functional equivalent of the organs of bilaterian organisms. Maybe this is an independent path taken toward an organ system level of organization. 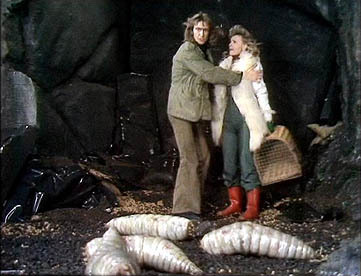 All the zooids are genetically identical, aren't they? So they are kind of equivalent to different organ systems -- digestive, reproductive, etc. Their genetic identity makes the superorganism status seem a little different from the situation in a termite or honeybee colony. It would be interesting to learn what kind of developmental signalling is used to cause differentiation into the different zooids. One thing puzzles me -- why the "superorganism" idea. I think that the "superorganism" idea wouldn't have appeared if siphonophores were considered in isolation. However, in other colonial hydrozoans the zooids are functionally independent with each of them able to feed, reproduce, etc., with differing degrees of integration allowing for nutrient transfer between individuals. Zooids in these other hydrozoans are produced by a similar budding process to the non-independent zooids of siphonophores, which would indicate that the functionally non-independent zooids of siphonophores are developmentally homologous to the independent zooids of other hydrozoans, rather than the entire siphonophore colony being homologous to a single zooid.